second common cause of death with their strength of social accounts. Yesterday, in a press release, the tech giant has acknowledged that the data shows frequent suicide attempts are very common in the age group of 15-29 years. While this is true, the youth being the world's future needs to be protected. Facebook, in its own way, is trying to connect people in distress with their concerned friends and family to help build a happier community. As promised, the company would soon refurbish the associated tools and technology and ensure a real-time help-based system by enforcing integrated suicide prevention tools, adding a Live Chat support from the crisis support organizations via Messenger, and Artificial Intelligence driven suicide reports. The pre-existing social network site is already well equipped to scan suicide-related statuses and help them start a conversation with a friend or direct them to suicide helpline numbers that actually saved many people from the wrong path. While Facebook's 24/7 team treats suicide reports with urgency, it shows different ways to overcome suicidal thoughts. According to the same report, the contemporary suicide prevention tools are available for more than 10 years and were built in collaboration with mental health organizations such as Save.org, National Suicide Prevention Lifeline, Forefront and Crisis Text Line and inputs from real people with in-kind experiences. In 2016, the system was extended further with the help of 70 partners across the world. However, even with such a system, choosing suicide as the only solution from peer pressure, broken relationships, career goals in teenage and especially in students is becoming very common and increasing. Recently, a class XI student from Kolkata bid bye on Facebook before hanging himself. Although in many cases Facebook, Google, and other search engines are found to be successful, it couldn't be enough to save all the socially active people. 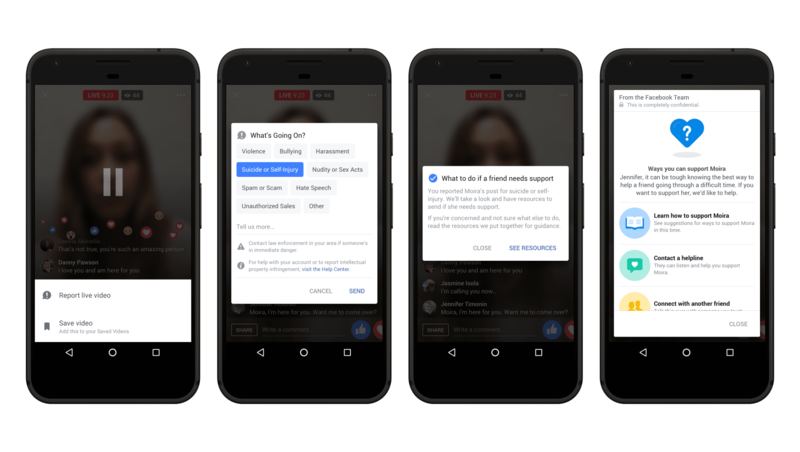 The recent update now integrates suicide prevention tools for Facebook posts with Facebook live where a person watching a live video will be able to reach out to the victim directly and report the video to Facebook. The reporter will be provided with resources to help their friend out of the situation. 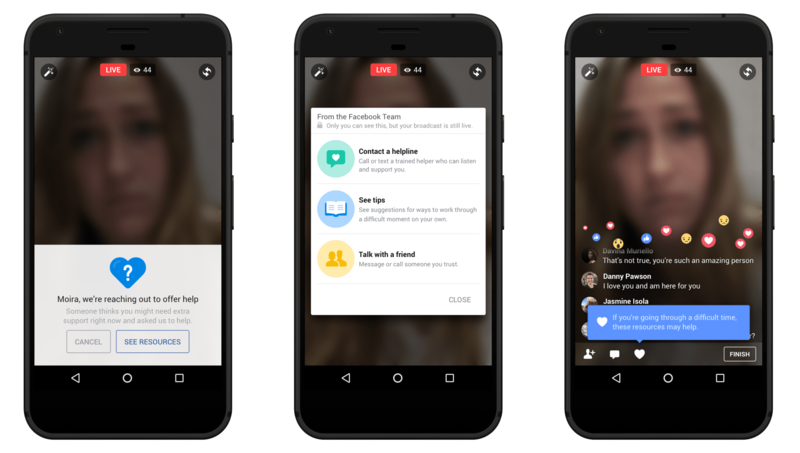 The person sharing a live video will also get resources including contacting a help line, providing tips etc. The reporters are advised to contact local emergency help lines. For more, they are also directed to check out the Facebook Help Center articles. partner institutes such as the Crisis Text Line, the National Eating Disorder Association, and the National Suicide Prevention Lifeline will provide support to the people in need by asking you to help them directly through Messanger or through the organization's page. With Zendesk's new back end tool, the system will be in experimental phase for next few months where you would see an option in your Messanger application to help people in need. Also, a recent video campaign with partner organizations will help raise the awareness, throwing light upon ways a friend in need, can be saved. Learning from the past posts used for suicide or self-injury are now clustered together to be processed with pattern recognition so that a streamlined report is easily formed. Also, these AI methods will screen the sites 24/7 to check for potentially similar messages and put them under manual review by the Facebook team. If matched, Facebook resources will reach out to the content writer. The test will initially be conducted in the US with supporting organizations and will be successfully implemented once the methods are absolutely checked. While these large organizations are coming forward and enforcing methods to save people under depression, psychological dilemma, people must understand the value of the only proven life before taking such action.